Friday 18th May was our 8th wedding anniversary! Thanks to IF, we nearly didn't make it to this anniversary this year... But the great news is that we have made it. We're both putting a lot of effort into communicating well, and supporting each other, and I can happily say that things feel stronger than ever. 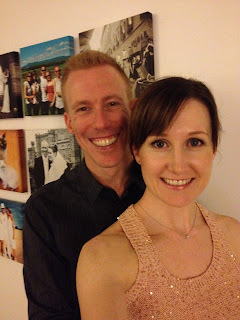 Here's a photo of us as we were just about to head out to celebrate at a restaurant. In the background, you can see a pic of us on our wedding day in Scotland (yes, I stood us in front of that wall on purpose). The meal was delicious, the company was better, and we spent most of the meal reminiscing about our wedding day, and some other memories of when we first got together. Here's a pic of the dessert that nearly broke us. My eyes proved to be bigger than my belly, as I enthusiastically ordered the dessert sampler for 2; and we could barely finish it! A warm and gooey chocolate ganache, lemon tart, creme brûlée, sorbet with fairy floss. Mouth watering - but WAY too much for us! Probably because it's our anniversary weekend, and probably because we've spent a lot of time chatting about some great memories, I've come up with another amazing and creative idea that I want to surprise Hubby with. This next one involves a lot of organisation and preparation, so I hope it'll turn out as well as I want it to. I'll be able to share it on my blog within a couple of weeks, so watch. this. space. All of that horrible work stress from last week has melted off me after spending such a nice couple of days with my Hubby. I am going back to work tomorrow with a positive attitude, and a shell of armour that my boss won't be able to destroy. Getting on with all of these creative things that I love doing is also helping me remain calmer. I have a history of not handling stress very well, and I know I need to get things under control as well as I can before we begin IVF next month. Anyway, here's my motivation for this upcoming week - Don't let anyone ever dull your sparkle! *Check out my updated P.Interest boards: I've just created a board for Infertility Bloggers too! Stopping in from ICLW #80. Happy Anniversary! I hope you have a much better week - I love that picture at the end :-) Good luck to you!